Inner London is the name for the group of London boroughs which form the interior part of Greater London and are surrounded by Outer London. With its origins in the Bills of mortality, it became fixed as an area for statistics in 1847 and was used as an area of local government from 1855 to 1965. It now has two common definitions. The first is the statutory definition delineated in the London Government Act 1963, coming into force on 1 April 1965, comprising twelve Inner London boroughs and almost identical to the County of London that was abolished at the same time. The second is the current definition used by the Office for National Statistics comprising eleven of the statutory Inner London boroughs and two of the statutory Outer London boroughs, and the City of London. Inner London is smaller than Outer London both in terms of population and area, but the density of population is more than double that of Outer London. Inner London is officially the wealthiest area in Europe with the most expensive street in Europe, GDP per capita is more than €80,000 while the UK GDP per capita is around €27,000. Many of the world's wealthiest people live in Inner London, but there is also widespread poverty. Central London is located at the core of Inner London. The area that is now Inner London was defined by the Registrar General as a collection of parishes called "London" and appeared in the 1851 Census. At the time the metropolitan area—commonly called the Metropolis—had its origins in the area of the Bills of mortality that had expanded from the tiny City of London into three surrounding counties over the previous several hundred years. The area become fixed in 1847 with the addition of Lewisham Poor Law Union and the parish of Hampstead. In 1855 the Registrar General area, with the addition of Penge, was used to define the district of the Metropolitan Board of Works. The Metropolis was also described as Inner London from the 1881 Census. In 1889 this area became the County of London. The area was adjusted in 1900 when Penge was transferred to Kent and South Hornsey was gained from Middlesex. The "Inner London boroughs" were defined by the London Government Act 1963. 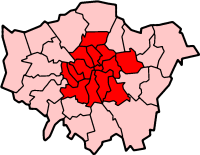 The Inner London boroughs occupied the same area as the County of London that was abolished as they were created. North Woolwich was an anomaly as it was part of the County of London, but became part of an Outer London borough. The main difference between Inner and Outer London boroughs between 1965 and 1990 was that the councils of the inner boroughs were not local education authorities and there was a single Inner London Education Authority for the area, including the City of London. The inner borough councils became local education authorities on 1 April 1990. The statutory definition is used as part of the grant settlement used to finance local government. Newham London Borough Council campaigns for recognition as an Inner London borough council for central government grants, as this would have financial benefits for the borough. It is not currently considered an Inner London borough as, with the exception of North Woolwich, it did not form part of the County of London. The City of London was not designated as an Inner London borough, but the Corporation of London is usually classed as an inner London local authority. The Office for National Statistics and Eurostat define Inner London differently, explicitly including the City of London, adding Haringey and Newham, but excluding Greenwich. The land area is 319 km2 (123 sq. miles) and the population in 2011 was 3,231,901. Figures before 1971 have been reconstructed by the Office for National Statistics based on past censuses in order to fit the 2001 limits. Figures from 1981 onward are ONS midyear estimates (revised as of 2010). After centuries of increase, the population of Inner London reached a peak of 4,998,237 in 1911. The population of Inner London then began a steady decline as the population continued to increase in Outer London. By 1951 the population of Greater London as a whole was in decline and Inner London reached its nadir in 1981 with a population of 2,550,100. Subsequently, the trend reversed and the population of Inner London recovered to 3,231,901 in 2011, some 1,766,336 short of the 1911 peak. For the purposes of the London Plan planning document produced by the Mayor of London, Inner London consists of the City of London, all the statutory Inner London boroughs and Newham. The area covered by the London postal district is sometimes referred to as 'Inner London'. However it is not coterminous with other definitions of Inner London as its area is somewhat larger and covers 624 km2 (241 sq. miles). 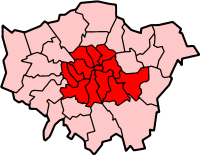 The southern part of the London Borough of Lewisham as well as a small part of the Royal Borough of Greenwich fall outside its boundaries whilst 44 of its 119 districts are in Outer London and its irregular shape stretches to the Greater London boundary at Mill Hill and Scratch Wood and beyond it at Sewardstone. From 1990 to 2000 London used two separate telephone dialling codes with one code designated for Inner London, however the area covered by this code was widely different from all of the above definitions and most of Greater London is now covered by a single 020 dialling code. There are approximately 200,000 businesses with around 2,000,000 employees in Inner London. 56% of all private sector jobs in Greater London are located in Inner London. There is significant commuting of workers from Outer London and from outside Greater London. Much of the commercial activity is focused on Central London and Canary Wharf. 10% of public sector employment is focused on Westminster around the Government of the United Kingdom. 1 2 "Archived copy" (PDF). Archived from the original (PDF) on 2013-04-03. Retrieved 2013-03-25. ↑ Simon Rogers (2011-03-29). "Indices of multiple deprivation: find the poorest places in England". The Guardian. Retrieved 2016-08-16. ↑ "1861 Census: General Report". Vision of Britain. Retrieved 2016-08-16. ↑ "1881 Census: General Report". Vision of Britain. Retrieved 2016-08-16. ↑ "Local authority lower tier boundaries – Greater London". ↑ "List of inner/outer London boroughs". London Councils. Retrieved 19 January 2014. ↑ "Inner London through time: Administrative History (post 1974)". A vision of Britain through time. Great Britain Historical GIS. Retrieved 2009-11-20. ↑ Mayor of London. London Plan: Chapter 2 (PDF). Greater London Authority. 1 2 "Archived copy" (PDF). Archived from the original (PDF) on 2014-02-01. Retrieved 2014-01-20.